Do you ever feel like life is a long and winding path? That sometimes you are on the right path and sometimes it just feels wrong? Do we have courage to stay on our path though we do not know where it is taking us or do we backtrack to a place of comfort only to start out again when we feel the time is right? I remember it like it was yesterday although it was closer to 12 years ago. I was HUGELY pregnant- and I mean huge. Like waddling penguin, rest a plate on my belly to eat huge. I had wanted and prayed for a family for as long as I could remember and we were close to that dream. I was working and on my way between sites when it hit me. This little person who I had not even met yet meant more to me than the world. The love I had for that little lump was so pure, so deep, so amazing that it overwhelmed me. I literally had to pull the car over to the side of the road. As the tears of joy swept over me (and I am sure a rash of exhaustion and hormones…) I gently placed my hands on my belly. 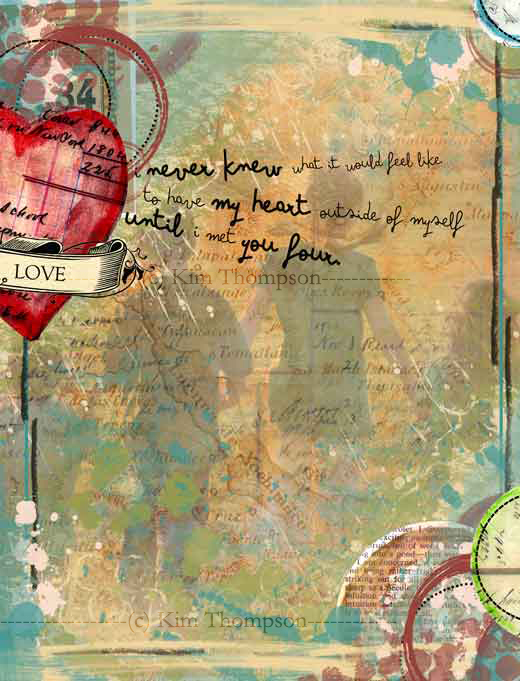 Art journal page created digitally with products from Jessica Sprague. In the next moment, all the worry set in, with my biggest fear at the forefront. I would have to work after having this little person. I would have to leave this part of my heart in the care of someone else. How in the world would I do that?! I couldn’t bear it! But there I sat, outside of work, dreading this thing that would come to pass instead of embracing the remarkable joy it had previously brought. I buried my emotions deep deep deep down instead of facing them head on and they owned me. And truth be told, it didn’t serve me well. I am trying to relearn how to enjoy the simplest things in life and embrace those moments but it is hard to unlearn some things. I took a long time to harden myself to raw motherly emotion… for the sake of what was “right.” And I believe each mom does it in their own way… its not “right” to bottle-feed. It’s not “right” to co-sleep. It’s not “right” to be a working mom. It’s not “right” to home-school or have your kids ride the bus or let them play video games or or or and and and… Here is the thing. What is right for me and my heart will most likely not be right for yours. That is a hard lesson to learn. The books don’t tell you that. But in each moment I chose to face my fears, I build a new life and fill in the holes I have dug and begin to create a steadier footing. And I wonder, why do we do this to ourselves? To what end? Why do we do things out of “obligation” or because we “should” when they make us so miserable? Why do we consciously turn our backs to the things that make us truly human, like raw emotion? Why can we not even really connect with ourselves… and then wonder why we feel so disconnected. I think the answer is fear. Fear of the what if. Fear of the unknown. Fear of letting our heart tell our mind that it is in fact the one being stupid. What if we owned our fears instead… gave them a name and called them out? Wouldn’t that serve us better? Wouldn’t that help our hearts to soar? Wouldn’t that ease the burden and allow life’s little joys to feel all that much sweeter? These are the things I am discovering as I examine my beginnings and set foot onto a path that has yet to reveal itself. Call a fear out today… give it a name and take away its power. That is what I have just done and I think you should too.